Deftly directed by APT stalwart James DeVita, the story focuses on three men who share a cell but are “divided by a common language” -- the American doctor Adam (a determined Josh Krause); the Irish journalist Edward (a witty Marcus Truschinski); and the English academic (a gentle Robert R. Doyle). Detained for months in a windowless, makeshift cell littered with cardboard, scraps of carpet and empty buckets, the prisoners grapple with boredom, despair, disorientation, homesickness, and indignity. Stripped to their underwear, chained by the feet and frequently blindfolded, they are allowed to leave their cell only to use the bathroom in full view of their Arab captors. While they fear death and the possibility that they’ll never be freed, the things that terrify them most are giving in to hopelessness and descending in to insanity -- the final loss of control. To pass the time, comfort each other and maintain their tenuous grip on reality, the three men argue, taunt one another, relive memories -- both tender and harrowing -- and play ritualized games. Occasionally the distractions seem cruel, at other times delightful, as if the prisoners have rediscovered the joy of children forced to play inside on a rainy afternoon, using their imaginations to take impossible journeys. The characters start out as types -- the rowdy Irishman carries generations of English oppression with him; the tough American evaluates the world through economics; and the delicate English professor retreats into poetry and tries to keep up standards of civility, along with his stiff upper lip. They’re also defined by how long they’ve been in captivity and how advanced their coping mechanisms are. 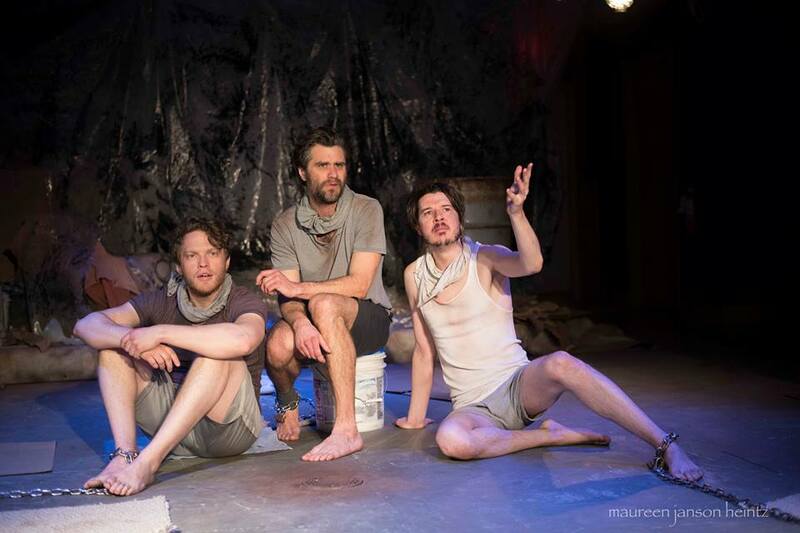 But as the play progresses through vignettes that are alternately horrifying, mundane and surprisingly funny, their idiosyncrasies, vulnerability and their common humanity shine through. As Edward, Marcus Truschinski is both a charming storyteller and competitive sparring partner for his fellow inmates. Delivering lines with the most humor and antagonism built in, he revels in the reactions the character provokes. Josh Krause’s Adam is the architect of the scaffolding that gives the prisoners’ days structure. His steely eyed determination to keep his strength up through exercise is mirrored by his compulsive and precise folding of his towel and in his dogged study of the two books the prisoners are furnished with -- the Bible and the Koran. Reveals about his complicated childhood feel unnecessary, but do reinforce his resilience. Robert R. Doyle brings a genuine love of language to his role as the English professor who is ill-equipped to deal with tragedy. Passages when he puzzles over Middle English poetry and recites some of his favorite writings are wrapped in reverence for historic texts that can illuminate his bizarre present. 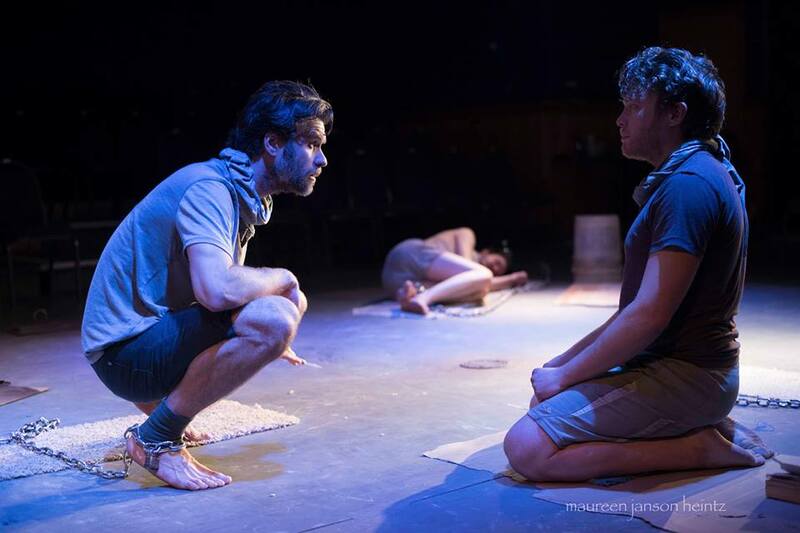 Staged in the intimate, three-quarter thrust at The Jefferson, Someone Who’ll Watch Over Me feels immersive, as if the audience was also sharing the inmates’ cell. In the first act that means we are drawn in to a search for activity to pass the time, where the time seems eternal. By contrast in the second act, we feel the disruption and loss as circumstances in the prison change dramatically. And we collectively realize that there is something worse than the prospect of endless incarceration or even death: There is the terror of being alone.